Mona Superhero is a multimedia artist who specializes in duct tape artwork. She is the In-House Muralist for Voodoo Doughnut, and you can see her works at all of our locations. Learn more about Mona and her work on her website. Voodoo Doughnut Too is proud to display three of her murals. 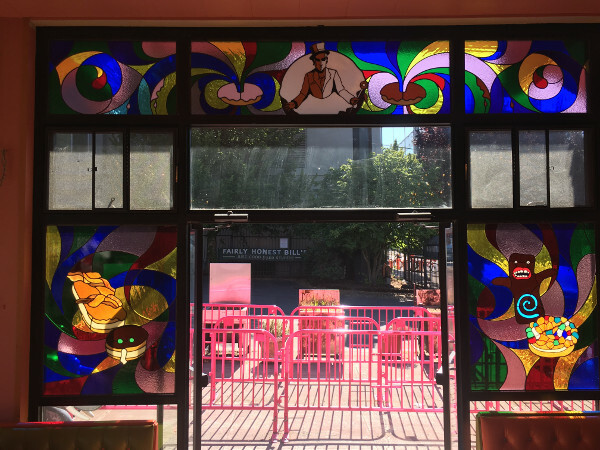 In addition to numerous residential and commercial jobs, Chuck’s studio has created the portrait and doughnut windows for Voodoo Doughnut. At Voodoo Doughnut Too, you can see images of our world famous Bacon Maple bar, the Voodoo Doll, Portland Cream (official doughnut of Portland, Oregon), and Captain my Captain doughnuts, as well as our Voodoo Baron.